Making sure our students are safe is the highest priority at South Shore Academy; students who are safe are able to learn and to make progress and to have a better life. To recognise and to ensure we meet our students’ needs all our staff have current Safeguarding Training, we have regular training throughout the year and a team of dedicated staff who comprise our Safeguarding Team. Our ethos is that “Protecting children is everybody’s business”. Our Safeguarding Policy details the approach the academy takes towards safeguarding; all staff adhere to this policy. South Shore Academy works closely with social care and Blackpool Safeguarding Board to provide support, referrals and in-house intervention for our students. The DSL (Designated Safeguarding Lead) is the Deputy Head of School, Ms Geibel. 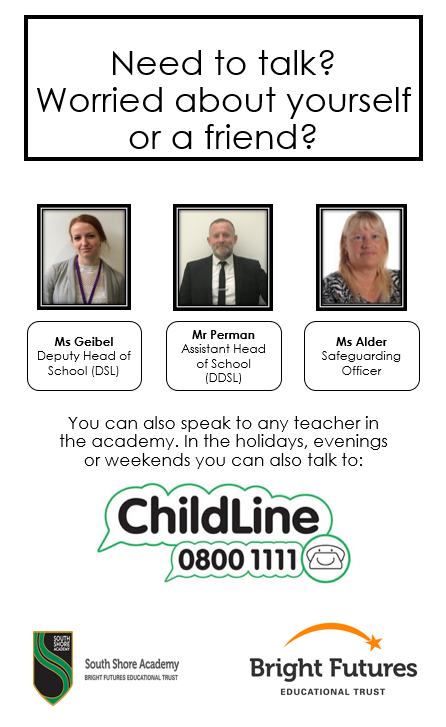 The Deputy DSL is an Assistant Principal, Mr Perman and we have a Safeguarding Officer, Ms Alder, who works closely with multi-agency teams. All concerns must be immediately referred to the DSL, or in her absence – a member of the Safeguarding Team.